UNITED NATIONS, Nov 17 (IPS) - The United Nations, which is working on an emergency footing to battle the outbreak of Ebola, is worried about the potential for further isolation of the hardest-hit nations in West Africa. "It's a psychological fear," Secretary-General Ban Ki-moon told IPS. "And there has been a chain reaction." He cautioned there should be no action which is not based on science or medical evidence. Ban said the fight against Ebola is a "top priority" of the United Nations and admitted he was conscious of the fact the disease has had a "heavy impact on all spectrum of our lives." The secretary-general's warning resonated in North Africa last week when Morocco postponed hosting the 2015 Africa Cup of Nations because of its own fears over the possible spread of the Ebola virus. Morocco's Sports Minister Mohamed Ouzzine was quoted as saying: "This decision is motivated mainly by the medical risks that this virus would put on the health of our fellow Africans." The New York Times said "fear of the spread of Ebola has now thrown Africa's most important soccer tournament into disarray." As a result, the Confederation of African Football last week removed Morocco as host of the biennial soccer championship, with Equatorial Guinea stepping in to take over as host of the 16-team games early next year. The three West African countries most affected by Ebola are Liberia, Guinea and Sierra Leone. Geographically, Morocco is a North African country. Last July, Seychelles forfeited a match after it refused to permit a team from Sierra Leone into the country because of concerns over Ebola. Meanwhile, there were unconfirmed reports that Philippine peacekeepers who returned home from Liberia recently were to be temporarily settled either on an island off Luzon or put on board a ship. Asked for a response, U.N. Deputy Spokesman Farhan Haq told reporters that once peacekeepers have completed their missions, these soldiers come under the authority of their respective governments. Ban told IPS he was thankful for the countries that have pledged "massive resources" to fight Ebola. These include the United States, UK, China, Japan, France and several other European countries. 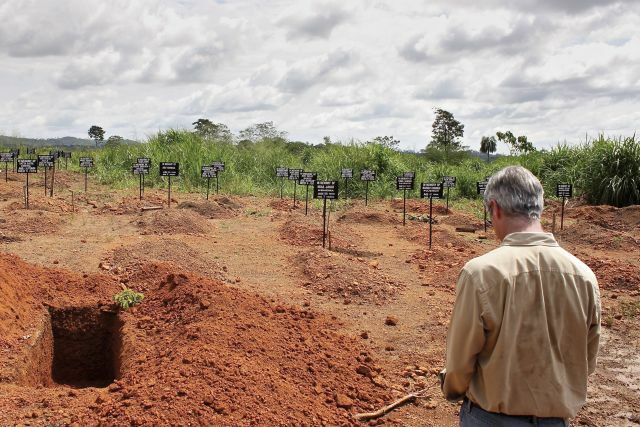 He singled out the United States for providing over 4,000 soldiers and Cuba for providing hundreds of medical personnel in the fight against Ebola. Last week U.S. President Barack Obama asked Congress to approve over six billion dollars in emergency funding to fight the spread of the disease and also protect U.S. nationals. "I hope the lame duck Congress will approve it," Ban said. According to the U.N. Office for the Coordination of Humanitarian Affairs (OCHA), the overall financial requirements are estimated at about 988 million dollars, of which 60 percent has been funded. Additionally, there is also a Trust Fund, with 58.7 million dollars as pledges. Anthony Banbury, head of the U.N. Mission for Ebola Emergency Response (UNMEER), told the 193-member General Assembly last week that "Ebola is a fearsome enemy and we will not win the battle by chasing it." The death toll has exceeded "a grim milestone" of 5,000, mostly in Liberia, Guinea and Sierra Leone, "with the real number likely to be much higher," he added. The World Health Organisation (WHO) has reported over 13,000 Ebola cases in eight countries: the three most affected nations in West Africa, plus the United States, Spain, Mali, Nigeria and Senegal. As the crisis continues, about 3,300 children have become Ebola orphans while food prices have been rising in the three affected countries, schools have closed and traders have refused to bring their products to the market. At the just-ended summit of G20 world leaders from both developed and developing nations, the secretary-general said, "The rate of new cases is showing signs of slowing in some of the hardest-hit parts of Liberia, Guinea and Sierra Leone. But as rates decline in one area, they are rising in others." And transmission continues to outpace the response, he added at the conclusion of the summit Sunday in Brisbane, which was hosted by Australian Prime Minister Tony Abbott. He urged the G20 to step up "so that we can meet the 70/70 goal: isolating and treating 70 per cent of all Ebola cases and providing safe and dignified burials to 70 per cent of those who have died." He said the international community must also address the secondary impacts on healthcare, education and soaring food prices caused by a disruption in farming that could provoke a major food crisis affecting one million people across the region. "It is important we do not further isolate these three countries by imposing travel restrictions. This will not impede the spread of the virus: it will simply hamper our efforts to mobilise support," he argued. According to the WHO, there is some evidence that case incidence is no longer increasing nationally in Guinea and Liberia, but steep increases persist in Sierra Leone.